It is awesome to consider: prolific Portuguese writer-director Manoel de Oliveira was 102 years old, last year, when he made the exceptionally lovely O Estranho Caso de Angélica. (De Oliveira, at 103, is currently making another film—and, ever the optimist, is already planning yet another.) This dark fable, which ends in a room from which all light is shut out, filling the frames with voluminous mystery in conjunction with the death of the protagonist, nonetheless hints at eternal love and life: through open doors we see the man’s spirit ascend with the spirit of his beloved just prior to a medical doctor’s pronouncement that the person has died. Toward the end, we hope for all sorts of things. 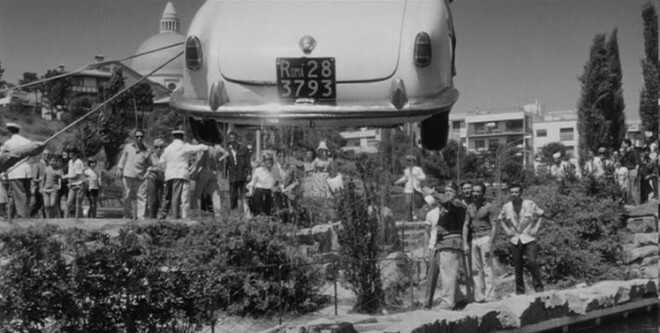 The time is the 1950s; de Oliveira first wrote the script, in fact, in 1952. The most unusual aspect of the romance is that the “lovers” never meet other than in imagination and dreams. They are both real individuals, but the young photographer, impoverished and wearing a threadbare jacket as a cloak of pride, is summoned by a wealthy household to shoot the final pictures of the daughter who has just died, all in the wee hours when no other photographer can be found. Isaac doesn’t “belong” in the rich house; a Sephardic Jew, he must assure the deceased’s sister, a nun, that he is unprejudiced—a wonderful glimpse of the kind of hoops that a poor person must jump through to get and retain even a fleeting job. In another sense, though, Isaac does belong there. The moment he sees the corpse, which seems to be smiling and even appears to look at him, he is in love. <uch of the early part of the film, which begins in darkness and heavy rain, in part as a projection of Isaac’s lonely, alienated existence, is doused in reddishness, both outdoors and in-. The blood of life? Or spilt blood, suggesting death? (The rain-battered street seems drenched in blood that washes away.) Later, blues and blue-green supplant the reds and rosy pink. A calming, or the chill of death that is creeping up on Isaac? Sabine Lancelin, de Oliveira’s superlative cinematographer, assists him in creating an atmosphere, a mood, at once powerful and delicate: an awakening of the heart’s desire as life is poised to evaporate. A haunting piano-piece by Chopin—although overused, as these things tend to be in movies—deepens the effect. One night Isaac dreams of Angelica (for that was the deceased’s apt name). With the color nearly drained, her ethereal spirit comes to take Isaac’s ethereal spirit—his body remains asleep in bed—on a lofty, lateral journey, a drifting through space and time. The primitive special effects recall silent cinema (de Oliveira himself began as a silent film director), specifically, the weightless solitary descent of the dreaming heroine in Jean Renoir’s 1924 La fille de l’eau. This entry was posted in Informal Capsule Film Comments. Bookmark the permalink.